Happy Friday fellow Fermentedly Challenged! Today is Intergalactic Star Wars Day. In other words, May the Fourth be with you. Always. It's ironic that today is also "National Day to Prevent Teen Pregnancy" and at the same time "No Pants Day". Those two don't seem to go well together. Here's what's happening around the Colorado beerosphere today Friday, May 4th, 2012. City Star Brewing (Berthoud) - Going to the Grand Opening this weekend? (May 4th-6th) - Check-in on Facebook at the brewery (mobile internet capability required), show it to anyone in a "City Star Brewing" t-shirt and you will receive a free beer token to use on your next visit (after their opening weekend). Hope to see many of you readers there on Saturday! Located at: 321 Mountain Avenue in Berthoud. Copper Kettle Brewing (Denver) - If you haven't had OG Burgers before, you are in for a treat! Come by CKBC after work and enjoy a pint and some awesome burgers! It's a great way to start off your weekend! Oskar Blues Home Made Liquids & Solids (Longmont) and American Eagle Distributing are doing an "Impossible Find" tasting at Oskar Blues HMLS in Longmont on Saturday, May 5th at 2:00pm. Join the folks from Samuel Adams as they debut several beers on draft currently unavailable in Colorado! There will be great food, prizes and brand new beer to enjoy. Among the Samuel Adams beer available will be: Griffins Bow Barleywine, Dark Depths Baltic IPA, Belgian Session Ale, Black And Brew, and Tasman Red Imperial Red IPA. Elevation Beer Company (Poncha Springs) is hosting an event starting at 4:00pm on Thursday, May 10th at Currents Restaurant in Salida, CO. They will feature the launch of Elevation's Robust Porter from their experimental Brewers Playground Series. Come out and enjoy several Elevation beers paired with great small plates. There will be live music starting at 8:00pm by guitarist Chris Nasca and a complimentary pint glass with the first 20 food and beer pairings ordered (yup, keep the glass!). Elevation Beer Co will officially have their grand opening the next week on Saturday, May 19th from noon to 9pm. Great Storm Brewing (Colorado Springs) - Throughout the month of May, bring your lunch to Great Storm Brewing Wed - Fri, 11 am - 2 pm, mention this story and receive 10% off beer purchases. Try out Sheldon's Luncheonette there in the center, or try one of Domino's hot sandwiches or personal pizzas. They can order Domino's for you put it on one bill, or you can bring in your own food. And as always, pretzels are free. Check out their game shelf - bring some friends and enjoy a game of poker, backgammon, or Rock'em Sock'em Robots! Steamworks Brewing Company (Durango) - Grats to Steamworks. Their Colorado Kolsch German-Style Ale won 1st Place for Best Local Tie-In in the 2012 Canny Awards at the Craft Brewers Conference in San Diego yesterday. The trophy received featured their can mounted on the trophy. View it on Facebook. Crabtree Brewing Company (Greeley) - Word on the street says that their is a new 16oz beer in a can coming soon from Crabtree Brewing. 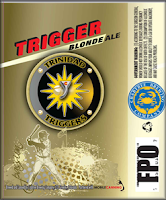 It's called Trigger Blonde Ale. It's named after the Trinidad Triggers - a Pecos League baseball team. This will become the 3rd canned beer from Crabtree via their association with Mobile Canning LLC. This beer will be sold exclusively at Tire Shop Wine and Spirits in Trinidad, CO. Fans and players of the baseball team will be invited to a special tasting event once the beer hits shelves. Maybe if we're lucky some of this will be available around Greeley. In other news, the rumor mill is saying that Crabtree Brewing may be moving their tasting room soon! Stay tuned for more on this possibility. Question of the Day - What beer would you drink that would help celebrate both Cinco de Mayo and the Kentucky Derby on May 5th? Dry Dock Brewing (Aurora) - There's going to be a special in-store tasting today 5-7pm at Vern's Liquor in Wheat Ridge, CO. Special 10% off Dry Dock bombers and receive a free pint glass and a free beer token with every 2 bombers purchased! Big Choice Brewing (Broomfield) - Don't forget, today is the Grand Opening for Big Choice Brewing. They're opening their doors at 4:00pm sharp and have plenty of beer for opening day. The Oskar Blues Bonewagon will also be there to satisfy your noms. Lots of activities at the brewery all weekend long. Visit them at: 7270 W. 118th Place in Broomfield, CO.
Avery Brewing (Boulder) - Today at 5pm Avery will be hosting their Nineteen Anniversary Ale Tapping. 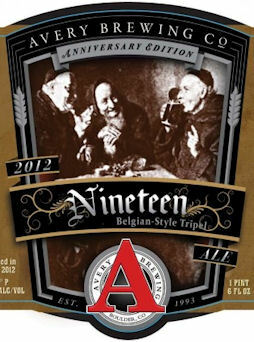 Nineteen Anniversary Ale, a Belgian-style Tripel to honor their fondest roots of brewing tradition and those loveable monks and brewers who gave them the inspiration. Celebrating nineteen years of brewing could kind of get overlooked what with the big 2-0 coming. But they will never forget 2011! Not only was it their largest growth year ever, but they also began designing their new brewing facility! In excited anticipation of 20 years and the new brewery, Avery concocted this very traditional, yeast driven, dry and fruity Tripel. A Belgian triple-flight of Nineteen, Karma, and Salvation will be available, as well as Belgian Waffles made to order from 5pm-7pm tonight! Grand Valley Beer Festival (Grand Junction) - Attention Western Slope! There's going to be a big beer fest coming to you on Saturday, May 19th from 1pm to 5pm. It will be held in the University Center Ballroom on the Colorado Mesa University campus. This is the 2nd annual event. Cost is $25 in advance or $30 at the door. This is a craft beer tasting and “People’s Choice” fundraising event for the Maverick Club, the booster organization for Colorado Mesa University Athletics in Grand Junction, CO. Enjoy music, food, and Colorado’s favorite beverage! No admission charged to non-tasters or designated drivers. For more info and tickets, go to their official web site: grandvalleybeerfestival.com. Boulder SourFest (Boulder) - Holy cow! Tickets to this year's 3rd Annual SourFest at Avery Brewing sold out in only 2 minutes this year! Sour fans were obviously ready last week when tickets went on sale. If you missed out we feel your pain - so did Fermentedly Challenged. Look for opportunities to win tickets from various venues around the state. Keep your eyes open. Pikes Peak Brewing Company (Monument) - Tap Your Inner Chef! Many of you have had opportunity to enjoy the amazing food that Chef Greg Soukup of Blue Sage prepares for PPBC special events. Now, you'll have a chance to learn some of his secrets! On Monday, May 14th from 6pm-8pm, join Chef Greg at PPBC to Tap Your Inner Chef! He will put on a cooking demonstration and pair each course with a PPBC beer. The cost is $25 and class size is limited to 18 participants. Reserve your spot at PPBC today! Also stay tuned to Facebook for word on their pending release of Summit House Barrel Stout in bottles coming soon. Also stop in on Saturday nights from 7pm to 10pm for live music at the brewery. Rifle Brewing Company (Rifle) - There's going to be a tapping party on Wednesday, May 9th from 5pm to 9pm at Sammy's on Park Avenue. They'll be tapping their Blonde Navel. Get $2 pints during the event. Located at 412 Park Avenue in Rifle, CO.
Scavenger Hunt Brew Style (Fort Collins) - Play. Explore. Enjoy. Explore the Fort Collins brewery scene with our free scavenger hunts. Grab some fun friends, pick your brewery adventure, complete challenges and snap trip pics along the way. Start at any port but pace yourself. Promoting a community of beer lovers, explorers, and responsible drinkers. Visit their web site for more info: www.scavengerhuntbrewstyle.com. Visit them on Facebook too. Oskar Blues (Longmont) - Make way for more bigger cans! 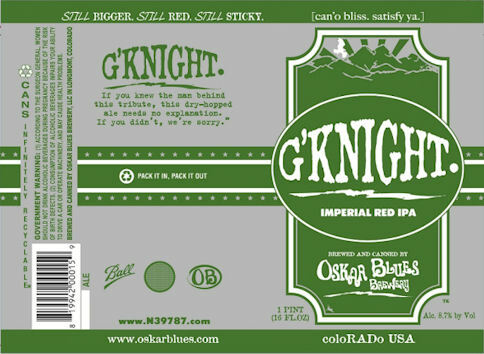 Oskar Blues will soon be putting their famous G'Knight Imperial Red IPA in big 16oz tall boy cans. G'Knight will join Deviant Dales in the larger sized cans. Look for these in 4-packs coming out soon. Boulder Beer Company (Boulder) - A new video was released showing a recent canning run of their Hazed & Infused beer. Boulder beer worked with Mobile Canning LLC of Longmont to set up a temporary canning line at the brewery. Check out the video by Greg Lipinski on YouTube. Kevin Baity Kraft Beer (Colorado Springs) - Their new 2X Amber Lager hits their taps at KBKB just in time for Cinco de Mayo. Vine Street Pub & Brewery (Denver) - May the Fourth Be With You! Come in to the Vine Street Pub today dressed as your favorate Star Wars character and get a free pint of house beer! Choose from a selection of over 21 beers on tap. Twisted Pine Brewing (Boulder) - For lovers of extremely hot chili beer, Twisted Pine has officially brought back their Ghost Face Killah beer. Made with extremely hot ghost peppers, this beer is sure to test your medal for heat tolerance. If you've never tried this beer before, check out the review I did on this "hot" beer earlier this year. Have some milk standing by to cool the burn! Are you up to the challenge? Dad & Dude's Breweria (Aurora) - Looking for something a bit different? Head over to Dad & Dude's and try their Basil Agave Blonde, the Hoparazzi Black IPA and their Rosemary Peppercorn Red on tap. New guest taps include: Tommyknocker Saison, Boulder Beer Mojo Risin Double IPA and Left hand Polestar Pilsner. Colorado Beer Week - Join in under the afternoon Colorado sun at the opening ceremony hosted at the Highland Tap and Burger on Saturday, May 12th from 12pm to 5pm. Opening festivities will feature more than 15 breweries and 2 Colorado distilleries. VIP guests will enjoy early entry, 6 oz full pours and your choice of a Beer Can Chicken prepared with Gubna from Oskar Blues or a delicious sausage plate with sides. General Admission guests will enjoy 3 oz pours of more than 35 beers and the opportunity to purchase the Oskar Blues Beer Can Chicken and sausage plate. Finally, Colorado Beer Week would like to welcome the Colorado Craft Beer Radio Show AM 760 who will be broadcasting live from 12:00 – 1:00 at the Opening Ceremony. Located at: 2219 West 32nd Avenue in Denver, CO. Tickets are available now! Visit www.cobeerweek.com. Denver Beer Company (Denver) - New beer tapping alert! Today's the day for Misseur Flaneur - their newest Saison. Go grab a glass of it and a plate of great eats from the Harvest Foot Truck parked outside the brewery. It's a great day to sit outside and have a brew. Rockyard Brewing (Castle Rock) - Today only - Jellyman's Deviation: Government Warning a bourbon barrel fermented imperial stout. A wicked mess of sweet malty stickiness and burnt dark toffee with a lingering bitterness in the finish. Take this one slow it is a 16%ABV beer. Served today at 4pm until it is gone! Great Divide Brewing (Denver) - It's FIRKIN FRIDAY. Join GDBC for 10oz pours of "Don't Eat The Cookies," a sticky-icky dry-hopped double IPA. They open at 2pm and Basic Kneads Pizza will be here for dinner service. Gnarly Barley Beer Festival (The Ranch - Loveland) - Tickets for this year's Gnarly Barley Beer Festival (August 4th) go on sale tomorrow, Saturday, May 5th. There are two levels of tickets: General Admission Ticket - $15.00 Includes sampling mug and 7 sampling tokens. Additional tokens available for $1 at event; VIP Admission - $55.00 Includes sampling mug and unlimited 4 oz samples, 12:30 entrance to Gnarly, access to VIP tent with food and specialty beers, a souvenir t-shirt and pint glass. More info at: www.gnarlybarleybrewfest.com. Looking for some music to go along with your beer? Check the Brewery Music Listings and see who's playing at your favorite brewery or beer bar in Colorado. Updated daily. Looking for a beer festival? Check out the listings on the 2012 Colorado Beer Festivals & Events Calendar. There's even more Colorado beer happenings and discussions on the Fermentedly Challenged Facebook page. Thanks for helping us grow to over 800 "Likes" so far in 2012!